Pet owners need to know one thing: the pet needs to have a healthy relationship with its owner. In order to achieve that, the owner must enable the pet to behave how it would naturally. This means that some sacrifices must be made. Cats, for instance, can be a nuisance for those who are unprepared to accommodate their quirks and habits. Cats scratch furniture and other items in order to sharpen their claws and to mark their territory. Cat paws have a gland that secretes smell, something that will stick to items when scratching and will alert other animals passing-by, keeping them at bay. Acting violently towards a pet for damaging property will create a very inhospitable and unsafe environment for it. In order for the pet to develop naturally and in a healthy way, it’s important to make a small investment for its comfort. That being said, cat scratchers are the ideal items to keep a cat stretchy, scratchy, and happy. They come in different sizes, and there are a lot of variations when it comes to design. Anyone can find the perfect fit for their house and pet. 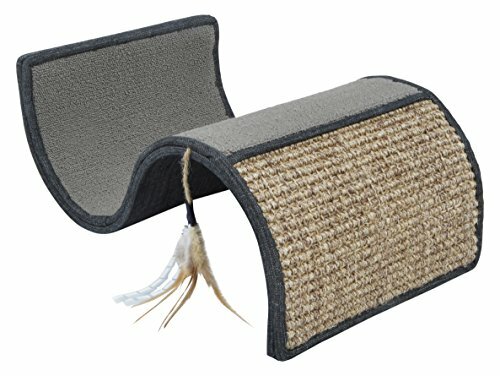 Cat scratchers are made using cat-friendly materials and are an ideal way of offering these little critters a special corner in which they can develop and feel like the ferocious felines they are. If you are looking for one, check out the Petlinks Dream Curl Scratcher. Keeping the pet excited with pet-related toys and products is the most challenging thing. The makers of the Dream Curl Scratcher came up with a nice solution to this problem. On the lower curve, they have installed a catnip toy, which is a sure-fire way to keep the cat entertained and excited about its new scratcher. That being said, the catnip toy doesn’t seem to be very sturdy and might have to be tinkered with and maintained to keep it part of the product. Truth be told, kitties are known to be destructive at times, so any responsible cat owner should already be prepared for a bit of cleanup after their beloved critters. As stated above, the carpet material and the wavy shape make this thing very compact and lightweight, even if it has a rather large surface. This means that the cat owner can move it around for trips without causing too much of a hassle. Having a somewhat portable cat scratcher is a great thing since the kitty will feel more at home and more comfortable if it has a familiar item present in a new environment. Design-wise, it’s not that big a hit. Sure, the wave is interesting, but here’s where the interesting things stop. While the fact that it is made using different types of carpets might point towards a recycling process, the overall aspect isn’t the most pleasant. In addition to this, these scratchers can’t really be installed anywhere. It would be nice if one would have the ability to mount them or to make a more elaborate setup using two or more. There are a lot of scratchers who use rope out there, but this one uses carpet. Carpet fibers are tougher since carpet itself is denser than rope. This means that it will last longer and hold together better in the long run. Although useful, carpet is a bit of a double-edged sword when it comes to maintenance. While it does last longer than rope, one can’t really replace the material, as they would with a classic scratching pole. Petlinks are confident enough in their product to sell it with a 100% customer satisfaction guarantee policy. This means that the customer is protected from defective products, a very important process in online shopping. First off, what makes this item interesting is its appearance. The curved shape makes it have more surface area but in a more compact package. In addition to the space-saving aspect, it’s also quite attractive, making it more likely to captivate the attention of your pets. While it’s not particularly sturdy, it’s tough enough to keep the kitties entertained without breaking down. After all, they’re not full-sized tigers. The carpeted areas also have different textures and weave, so the cat will have a lot of choices when scratching and playing. It’s hard to find the right product for anything nowadays. There are so many similar products on the market that the average user will go insane if he or she attempts to scroll through all of them. Let’s take a look at a similar product from the same price range to see just how good is the Petlinks Dream Curl Scratcher. The Trixie Wavy Plush Cat Scratcher is very similar to the aforementioned cat scratcher. Sharing the wave design, this particular cat scratcher makes everything more awkward and less polished. It attempts to use the same “different texture” model, but it lacks the finesse that the manufacturers at Petlinks used in their product. Additionally, it has none of the features that aim to keep the pet interested in using the product, like the catnip toy that the Petlinks Dream Curl Scratcher has. All in all, it’s a poor investment, and it can definitely learn a thing or two from the Petlinks Dream Curl Scratcher. Color varies - available in Slate and Cinnamon. A color will be selected at random and cannot be specified at this time. The Petlinks Dream Curl Scratcher is a great product. When compared to similar items from the same market, it’s easy to see why it’s superior. The design, while not the best, is solid and reliable. Overall, any cat will find it entertaining and will keep stretching and scratching at it day and night. The catnip toy is a nice feature and will definitely keep spirits up and claws sharp and ready!